In this post, we will discuss how you can setup minimum required time for delivery for an order and how to add total number of available dates for delivery. These 2 features are available under the Date Settings tab of Order Delivery Date Lite for WooCommerce plugin. Businesses that take advance orders or provides delivery of freshly prepared products can make the utmost use of these features. Let us understand each of these features in detail. As the name suggests, this feature is mainly useful to add the minimum number of hours required to prepare for delivery. Let us take an instance of a cake shop where they provide freshly baked cakes upon request. You require 24 hours for preparing the cake for delivery therefore you will want next 24 hours to be disabled from the current time for the customers to place the order. When a customer tries to place an order, the first available date for delivery will be after 24 hours from the current WordPress time. This feature will allow you to limit the available dates for delivery in WooCommerce. It is best suited for businesses that take advance orders for delivery. 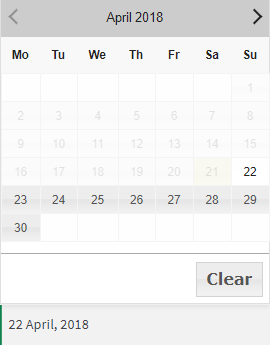 For instance, say you have a shirt manufacturing company that takes orders for 35 days in advance, then you can set the number of available dates to choose settings under the Date Settings tab. 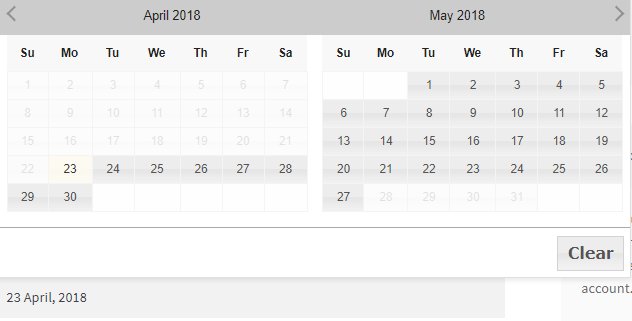 Here the current date is 23 April 2018 as per the WordPress timezone. So 35 dates will be available for delivery from 23 April 2018 to 27th May 2018. In this post, we saw how you can setup the minimum preparation time for delivery of an order and limit the number of dates available for delivery on the checkout page. These features are useful for all types of businesses that requires time for preparation before delivery or who takes orders in advance.